Those are the basic functions which we are demanding from a cloud system. One of the main goals of this article is to compare sharing features of the cloud-based services in the relation to the most frequent everyday office tasks mentioned above. Large IT enterprises, such as Microsoft, Google, Apple, Amazon or other offer some sort of cloud-based solution nowadays. There are many different cloud products, e.g. iCloud, Google Apps, SkyDrive, Dropbox, Amazon Cloud Drive and many others. We are focusing on two of them – Apple iCloud and Google Apps (for Business). Customers who are planning to adopt cloud-based solution in their IT infrastructure can find choosing the most suitable product difficult. Variety of cloud services can make understanding, decision process and implementing specific cloud product problematic. Before we dive into the specific cloud solution, let us have a look at the cloud technology in general. Cloud computing is a technical as well as a marketing term, which is inflected quite often in the last 2 or 3 years. This term generally describes access to the hardware, software and data storage, all as a service (computing as a service) through a computer network (e.g. Internet). Cloud computing has often a form of web applications or tools, accessed through a web browser, and used in the same way as if the user had them installed locally on his PC. The latest web technologies such as HTML5 or AJAX are frequently used. Not only web browser, but also desktop or mobile applications can access the remote resources. Either way, the core of the offered services is located in the remote data centers. When planning using cloud-based solution, we have to consider advantages and disadvantages of this approach to our IT infrastructure. In the following paragraphs we are summarizing main pros and cons of using cloud-based solutions. One of the main advantages of using cloud services is their availability. Users can connect and work whether they are in the office, at home, or on a business trip across the globe. Internet connection and computer or a post PC device (such as smart phone or tablet), are the only limiting factors. Many cloud services are accessible by a web browser. This fact allows customers to use different platforms (MS Windows, Apple OS X, many Linux distributions and many mobile operating systems). Some cloud services providers are also developing client applications for different platforms to provide customers with better user interface. Many organizations or individuals can find using cloud services risky regarding data security. Data are stored on remote servers which can make users feeling that they have no control over what is happening to their data. Not to mention data which are considered as highly confidential. Companies like Google are trying to reframe these customers’ perceptions by ads explaining how secure are their datacenters and what they do to keep users’ data safe. Using cloud services brings up new issues which we need to keep in mind. When there is a problem with the Internet connection, access to our cloud services can be significantly limited. This issue is usually solved by the architecture of a cloud system when all of data are stored locally and in the cloud as well. When changes are made to the content on the local side – in a client application, content is then synchronized with the cloud. This approach allows us to work on our projects even though Internet connection is not available. On the other hand, situation can be different with services where the whole user interface is located on remote servers. When a connection problem occurs in this type of architecture, we cannot continue working on our projects until the problem is resolved. Other approach to prevent the issue with the Internet connection, which many companies are implementing, is redundant Internet connection from different Internet providers. When one connection is down, other can back up. The next table provides an overview of available storage and pricing offered by the cloud services providers. There are available more variants, but we have chosen the most suitable variations for a small business or home usage. Because Office 365 is paid service in all offered versions, we decided to focus on the comparison of the free services from Apple and Google. Note that iCloud may be used only if you own an iOS device. All these services are accessible by a web browser, which means, we do not need any special software. If apps provided by Google are not enough, there is an app marketplace where we can find other apps which can support our business processes. Some of the features are accessible through a web browser, others only from iOS devices or a Mac. Apple also provided an iCloud Control Panel for those, who own some iOS device, but use Windows PC. There are functions enabling the user to share information, such as calendars, reminders or others. We are describing these functions later in the article. 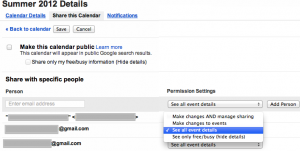 Google Calendar is a standalone web application. It offers standard calendaring features with a friendly user interface, although it’s not as complex as other calendaring applications (e. g. Microsoft Office 365 Calendar which is the part of Microsoft Outlook online). 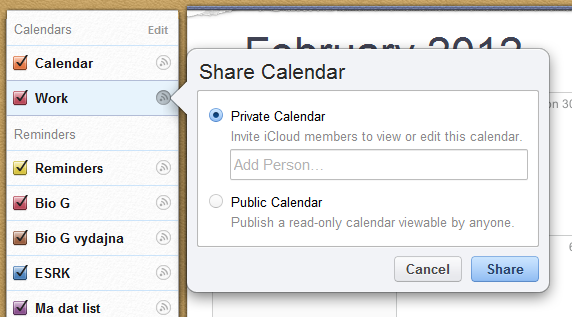 When we select this sharing option, our calendar will be shared with everyone who has access to the Internet. Information in our calendar will be available in the search results and everyone will have read-only access. Direct link to the calendar, which we can share with others, will be generated. Google Calendar supports XML, HTML and ICAL output formats, which means, we can access shared calendar by RSS reader, web browser or client software (like Apple iCal). If we would like to share our calendar with specific people only, we can do so by entering their email addresses in the Share this calendar settings pane (Fig 1). 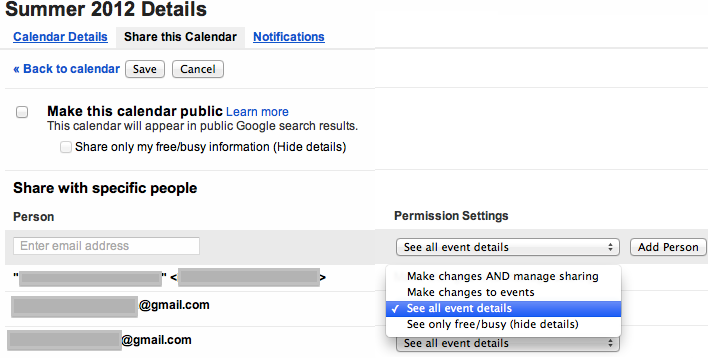 This option assumes that people, who we are sharing calendar with, have Google Calendar accounts already created. If the user’s email address, which is not bond to any Google Calendar account, is entered, we will be asked if we would like to invite him to use Google Calendar. 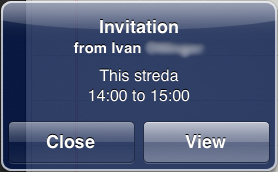 Without sending the invitation, user has no information about our shared calendar. We can also change permission settings for each user as it is shown in Fig 3. If we are building our own website we can embed calendar into website content. Look and feel customizations are available. 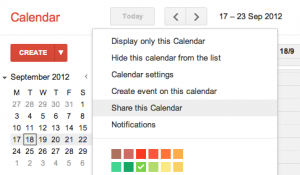 We can change colors, sizes, language, which calendars we would like to display and many other settings. 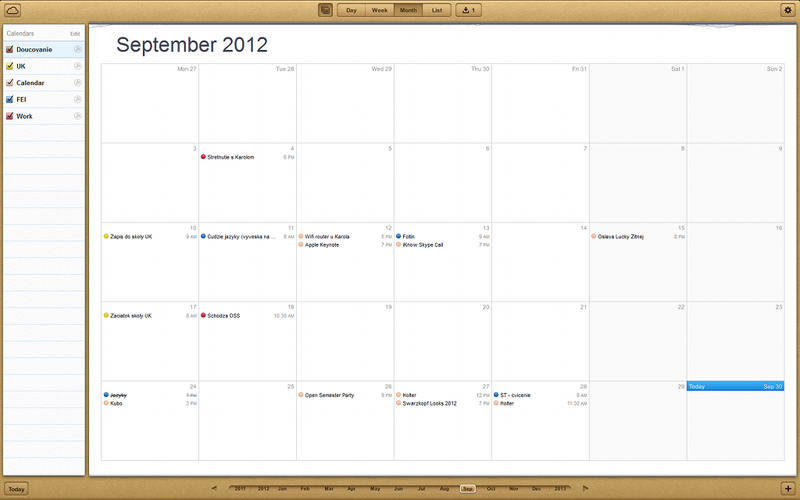 Calendars in iCloud work together with the calendar application in Mac OS X and in iOS. The user only needs to allow the use of iCloud in the device settings. 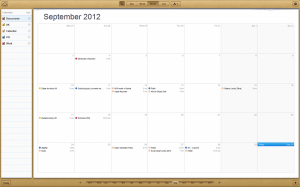 Microsoft users can take advantage of iCloud calendars using iCloud Control Panel and Outlook. Every update on one device is automatically pushed to all other devices in the background, without interaction of the user. 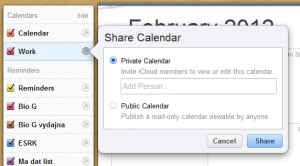 iCloud calendars can also be accessed through the official website. 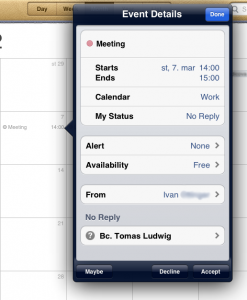 The design of the web application is nearly the same as calendar applications on Mac or iPhone. 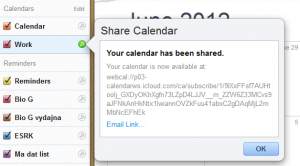 iCloud offers sharing and publication of a whole calendar. We will describe how to achieve this through the web interface. After opening the calendar application in the iCloud webpage, we can see a list of calendars on the left side of the screen. After clicking the round button next to the calendar name, the option for sharing appears. By clicking the appropriate radio button, we can select, if we want to make the calendar Public (read-only for everyone) or Private for selected persons only (editable). 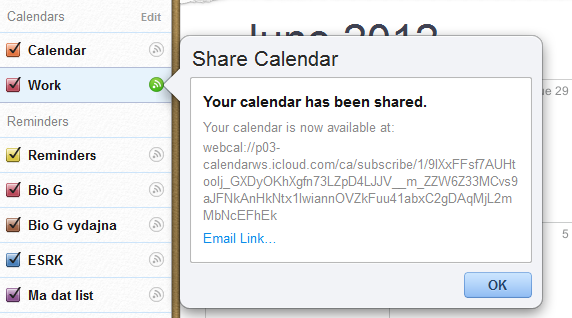 After sharing the selected calendar, the generated WebCAL link appears on the screen. If we select Public sharing, we can send or publish this link to the users, which should be able to access this calendar. If we select Private sharing option, the entered users will receive an information email about the shared calendar together with a WebCAL link for subscription. 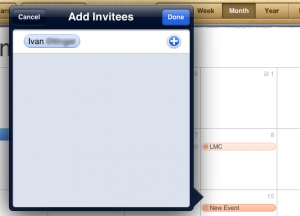 With the iOS version 5 came also the possibility to invite people to an event. This event will automatically appear in their devices and they can respond to the invitation. This feature is handy, because the users don’t need to enter the event on their own, but only one person enters the event to the calendar and invites all the others. When entering a new event in the calendar, users have the possibility to enter invitees. 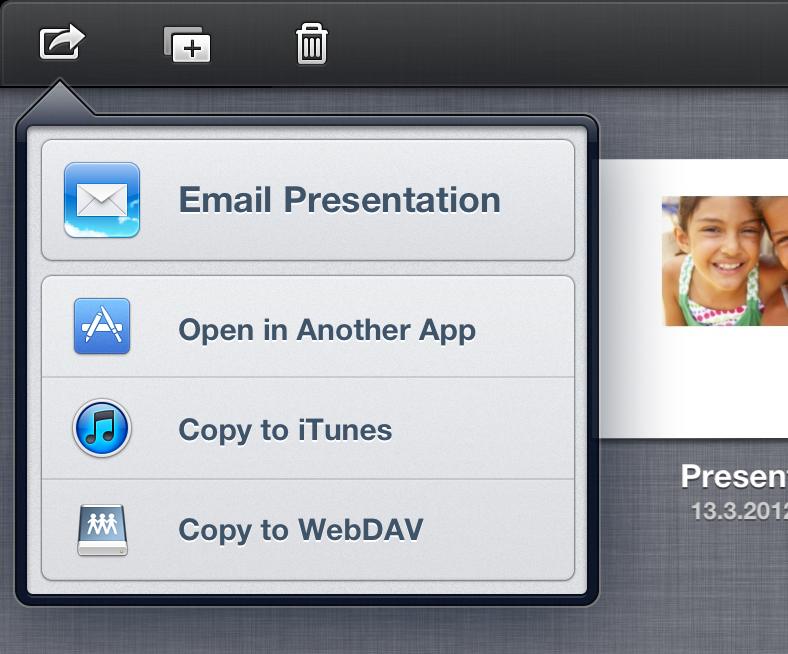 The invitation will automatically be displayed on the invitee’s iPhone or other device. 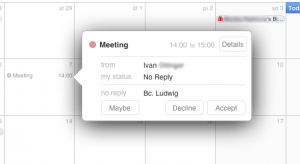 The invited person can reply to the event and it will be automatically displayed in their calendar. Tasks applications, TODO lists or reminders help us not to forget important tasks or actions we need to accomplish. 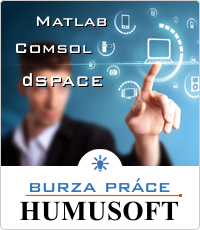 These applications are often included in cloud services products. Sharing tasks can be useful when more people are working on the same project for example. Everyone sees what needs to be done, can add new tasks, or can “check” already accomplished tasks. 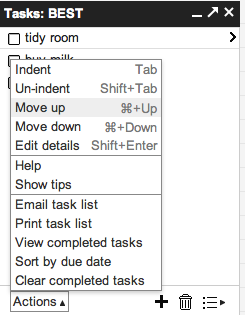 Tasks list which can be found in Google Calendar and Gmail application unfortunately doesn’t provide full-featured sharing functionality. Only option is to send tasks list by email. 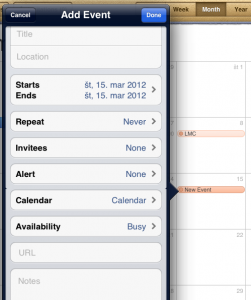 After launching iOS 5 and iCloud, reminders were a part of the calendar application at the iCloud website. 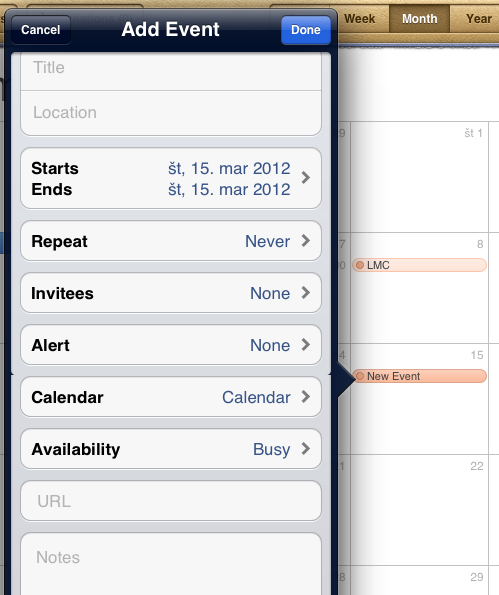 The reminders were listed under the list of calendars and the sharing worked the same as with calendars. 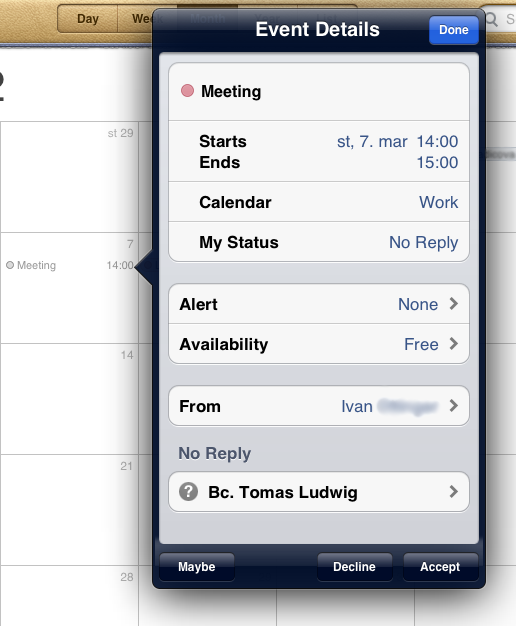 However, in the latest version of iOS and iCloud, there is a dedicated application for reminders. Unfortunately the sharing option disappeared from the web application. There is also none option for sharing in the iOS app. The only possibility to share a reminder list is through the OS X application. 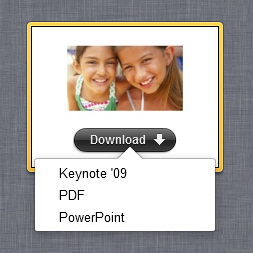 We just need to click the sharing icon which appears next to the reminder list name, when the mouse cursor is over it. We enter an email address and click done. 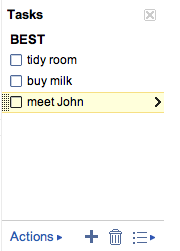 All users, which have access to our reminder list can add, remove, edit reminders or check their checkboxes. We should be aware that these web applications can not be compared in the field of features and functionality with the standard office applications. Google Docs web applications offers only fraction of the features we are used to from applications like Microsoft Office, OpenOffice or Apple iWork. On the other hand, web applications offer powerful sharing and collaboration features. After we choose one of the visibility options, we can decide which permissions will be granted to the users we are sharing document with. As we can see in the next figure, edit, comment or view privileges can be set for each user separately. For example, we can grant edit privileges to our co-worker and grant view privileges to everyone on the Internet. 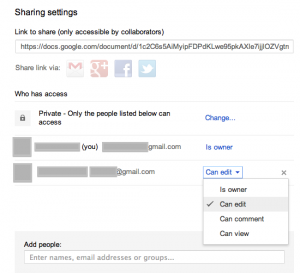 If we would like to share document with specific people only – they have to have Google account created. Next figure illustrates editing the same document by two users at the same time. On the right side of the figure we can see ongoing users’ discussion. Documents in iCloud work together with applications from iWork suite for Mac or iOS devices. iWork includes Pages, Keynote and Numbers apps, which are in functionality comparable to Microsoft Office application Word, PowerPoint and Excel. 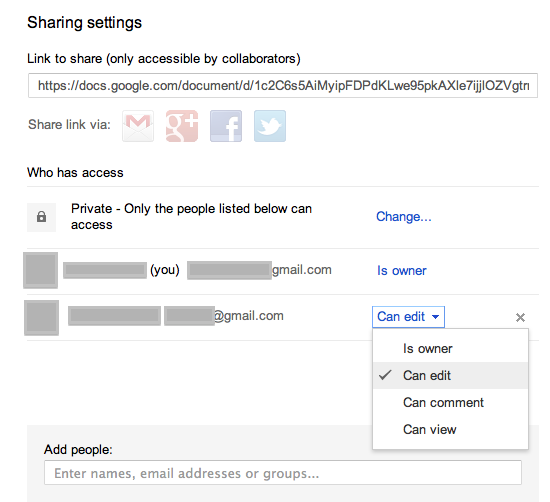 Comparing to Google Apps, iCloud documents do not offer any collaboration options or web editing features. They were designed for helping a single user to synchronize documents throughout his devices. 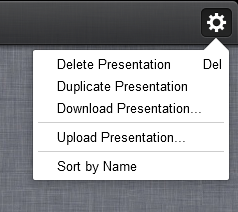 In the web interface, we have only the possibility to download, upload or delete a file. There is a simple sharing option in the iOS and Mac application – it offers emailing the file. In this article we were discussing sharing possibilities of cloud-based solutions (Google Apps and Apple iCloud) in a relation to the frequent daily office tasks. Each of these cloud-based solutions has different approach to provide users with a collection of services. Google Apps have been designed to fit the needs of the wide variety of companies and individuals. Apple is mostly home-user oriented. This affects the whole architecture of the particular cloud, features and services it offers. Google Apps are opened to everyone regardless accessing client device. They offer simple editing and collaboration tools. On the other hand, Google Docs lack more advanced editing features and so cannot replace the desktop office applications yet. In order to use Apple iCloud, one needs to use Apple devices; although synchronization with a Windows PC is possible. Similar restrictive scenario applies to the sharing features as well. iCloud scores with its easy-to-use user interface and straightforward configuration. There is no real winner; each of the mentioned clouds is interesting solution suitable for different customer with different needs. LUDWIG, T. Využitie serverového operačného systému Mac OS X Server v malých a stredných firmách. Diplomová práca. Slovenská technická univerzita, Fakulta elektrotechniky a informatiky, 2012. OTTINGER, I. Využitie serverového operačného systému Mac OS X Server v malých a stredných firmách. Diplomová práca. Slovenská technická univerzita, Fakulta elektrotechniky a informatiky, 2012. Co authors of this paper are Ing. Ivan OTTINGER, Ing. Martin FOLTIN, PhD.